Cette vidéo travaille la compétence "Expressing a possibility"
When communicating in the workplace you may wish to express the idea that something is possible and/or probable. There are various ways in English to express a possibility, and these vary according to the circumstances. In these sentences, there is a possibility that the first part (coming after ‘if’) is going to happen. The second part says what can be done. If he doesn’t cooperate we mayhave to give him an official warning. I mean … what's the ehhh, … the chain of command … I mean the structure … like, how does it work in practice here? 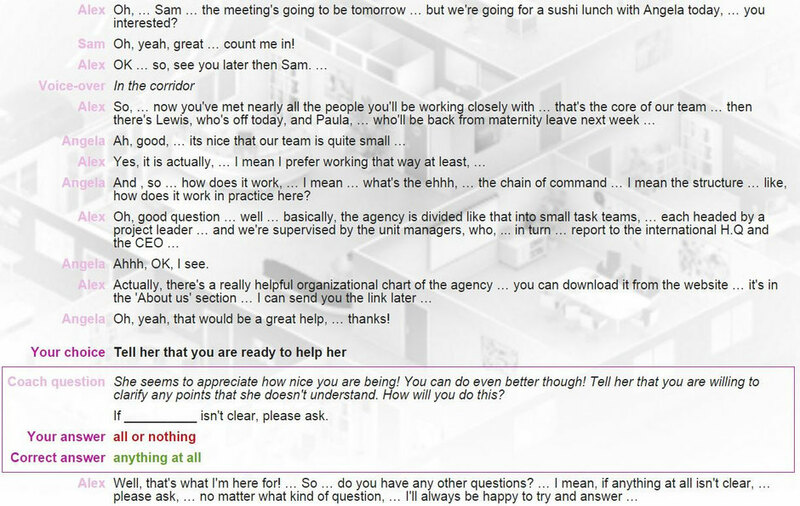 - Oh, … Sam … the meeting's going to be tomorrow … but we're going for a sushi lunch with Angela today, … you interested? - Oh, yeah, great … count me in!